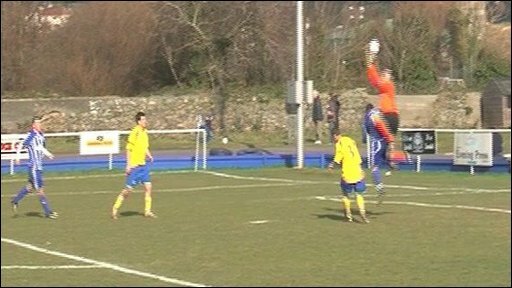 Belgrave Wanderers secured the Guernsey Senior County Division One title with a comprehensive 5-0 win over Rovers at the Track on Saturday. Matt Drillot scored four goals, including one from the spot, while Neil Le Cheminant claimed the other. It was Bels' third title in five seasons and captain Sam Cochrane said this time their aim is to retain it. "I'm over the moon. Over the whole season I feel we deserve it. We have worked very hard," he said. It is only the sixth time in the club's history that they have lifted the Priaulx Cup. Bels have one game left in their league campaign, against Guernsey Athletics on 20 March, but are eight points clear of their nearest rivals St Martins. Saints cannot make up the difference as they have only two games to play. Cochrane said: "We've worked very hard to get to this point, after a slow start to the season." And he said a big turning point for the team was going out to Northerners in the Wheway Cup. "I've never had a talking to from my coach like that before and it really turned it round," he added. "We had to sort ourselves out and we certainly did. We just got better and better as the season has gone on."